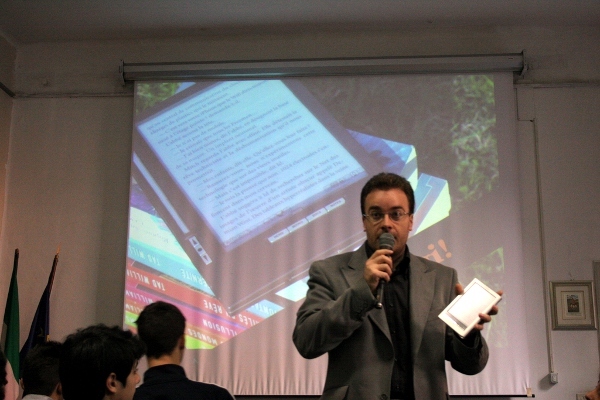 On April the 2nd, 2011, I’ve had the pleasure to do a presentation for an Italian celebration of the Document Freedom Day, or DFD. The DFD is a global initiative aimed to inform people about free document formats and promote their adoption. The event I’ve attended to was organized by the Free Software User Group Italia, or FSUG Italia; the location was a high school in Spoleto, a town in the middle of Italy and the audience was – mostly – students of that school and a few professors, although there were a few other people, including two tech-savy friars. Being a member of FSUG Italia, I’ve participated to this event regularly, usually with a presentation about Creative Commons. This year anyway I’ve decided to change subject: I’ve chosen to talk about ebooks, a subject I’m quite interested about; the topic is really broad, but I’ve chosen to outline few aspects, all free (as in freedom! ;-)). two pointers at free reading material (Liber Liber and Creative Commons writings in general); I’ve chosen Liber Liber instead than Project Gutenberg because the audience was Italian. [*] Why did I write an English article about an Italian presentation? No idea, I just felt like doing it this way!